A porthole design and massive case characterize the Royal Oak Offshore from Audemars Piguet. Top models combine classic functions, such as the perpetual calendar and minute repeater, with high-tech materials like ceramic or titanium. It's worth remembering the roots of the Audemars Piguet Offshore. Its porthole design is a clear indicator of its relation to a true watch classic: the Royal Oak. Audemars Piguet brought the Offshore to market in 1993 as a sporty and masculine evolution of the Royal Oak. Even today, its most important design characteristics are its massive case, integrated band, and large, octagonal bezel with eight hexagonal screws. The intricate "tapisserie" engraving on the dial is yet another characteristic feature of this luxury watch. The Royal Oak Offshore currently comes in numerous variants: from diamond-studded women's pieces to diving watches, all the way to the complex Grande Complication. Most of the "standard models" feature a chronograph function for measuring periods of time, including the Royal Oak Offshore Chronograph from 2018 with a blue "petite tapisserie" dial. This model pays homage to the very first Offshore from 1993. Its pushers and screw-down crown are coated with blue rubber, while both the bracelet and 42-mm case are made of stainless steel. To power this timepiece, the manufacturer chose the automatic caliber 3126/3840, based on the in-house caliber 3120, with a chronograph module. On the other hand, the 2018 Royal Oak Offshore Tourbillon Chronograph looks like something from the future, thanks to its skeletonized movement. This 45-mm wristwatch comes in stainless steel or rose gold. When fully wound, its power reserve lasts 7 days. Both versions should appeal to collectors, as each is limited to a run of 50 pieces. How much does the Royal Oak Offshore cost? You can purchase a mint-condition Audemars Piguet Royal Oak Offshore in stainless steel with the reference number 26470ST for around 20,900 USD. Pre-owned examples change hands for around 19,300 USD. This model is a particularly safe investment. Introduced in celebration of the Offshore's 25th anniversary, the ref. 26237ST costs almost 33,500 USD new. Earlier generations of the Offshore can be found under the reference number 25721ST and are coveted among collectors. Most Audemars Piguet fans will also know this watch by its nickname: The Beast. You can get a pre-owned example of The Beast for just under 15,000 USD. However, these prices can vary wildly depending on the watch's condition and whether or not it comes with the complete box and papers. The 42-mm Royal Oak Offshore comes in precious metals, such as yellow and rose gold. The rose gold version goes for around 55,600 USD new. Pre-owned versions sit at a similar price point. Models in yellow gold are a bit more expensive. Plan to spend about 66,000 USD for such a piece in mint condition. The Royal Oak Offshore Chronograph is also available with a 44-mm case. Variants in stainless steel cost about 25,800 USD new and 24,300 USD pre-owned. On the other hand, the platinum edition demands anywhere from 52,900 to 58,700 USD. Diving watches in the Audemars Piguet Royal Oak Offshore collection are water resistant to 300 m (30 bar, 984 ft), making them robust enough for your next diving trip. The Royal Oak Offshore Diver comes in a number of bright colors, such as turquoise blue, lime green, yellow, orange, and purple. What's more, this series also includes Offshore models without a chronograph function. Set aside around 14,600 USD for the two-hand version with a 42-mm stainless steel case. Pre-owned examples are only slightly less expensive. The Audemars Piguet Royal Oak Offshore Diver Chronograph is also available in various bright colors. The edition with a blue "méga tapisserie" dial and blue rubber strap is limited to a run of 400 pieces and costs about 26,600 USD new and 22,700 USD pre-owned. The green and yellow editions are even more eye-catching and rare. Each is limited to only 50 pieces. You can buy a new yellow model for almost 26,900 USD, while pre-owned examples go for around 23,700 USD. At 38,700 USD, the green version is markedly more expensive in mint condition. Even so, pre-owned models sell for around 27,800 USD. The most complex models in this collection come with a chronograph function and tourbillon or with a perpetual calendar, chronograph, and minute repeater. A stainless steel Royal Oak Offshore Tourbillon Chronograph sits around 240,000 USD new. The skeletonized version in rose gold commands a price of about 256,000 USD. Pre-owned examples demand significantly less and can be had for around 162,000 USD. The Grande Complication models represent the apex of haute horlogerie. Mint-condition pieces in rose gold cost over 880,000 USD. 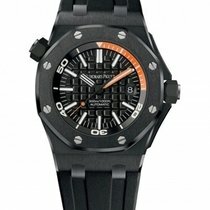 Audemars Piguet regularly releases special editions of the Royal Oak Offshore. One such timepiece is the Royal Oak Offshore Michael Schumacher, dedicated to Formula 1's most successful driver of all time. This watch comes in titanium, rose gold, or platinum. Each version is strictly limited: The titanium edition is limited to 1,000 pieces, the rose gold to 500, and the platinum to only 100. The latter is the most expensive, with a pre-owned price of over 144,800 USD. The gold variants come in at around 113,000 USD new and 108,000 USD pre-owned. At about 62,500 USD, the titanium model is the most affordable. 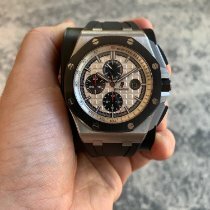 Audemars Piguet has also developed a limited edition Offshore for Rubens Barrichello – Schumacher's former Ferrari teammate. There are a few versions of this model as well. The titanium edition is limited to a run of 1,000 pieces and costs about 46,600 USD new and 42,800 USD pre-owned. The rose gold version is even rarer, with a run of only 500 examples. Set aside around 63,700 USD for this timepiece. Limited to 150 pieces, the platinum model demands over 95,000 USD in very good condition. Arnold Schwarzenegger is yet another celebrity with a number of limited edition Audemars Piguet Royal Oak Offshore models dedicated to him. Two examples are the T3 and the End of Days. The latter is limited to 500 pieces and costs about 48,100 USD new and 31,300 USD pre-owned. On the other hand, you can purchase one of the 1,000 examples of the T3 for around 41,700 USD. Pre-owned T3 models also cost around 31,300 USD. The Audemars Piguet Royal Oak Offshore Arnold Schwarzenegger The Legacy is even more affordable: This series is limited to 1,500 pieces and demands around 34,700 USD both new and pre-owned. The Royal Oak Offshore Bumblebee and Safari represent yet another pair of popular Offshore models. "Safari" refers to the first ever Royal Oak, as this is what the personnel at Audemars Piguet called this timepiece internally. The Offshore collection features a model bearing the "Safari" name. This watch is as close as any current model gets to the original from 1972. You can get a never-worn example for just under 19,700 USD and pre-owned pieces for 15,200 USD. The Royal Oak Offshore Bumblebee gets its nickname from the yellow and black design of its dial. Pre-owned examples of this chronograph sell for about 19,000 USD, while those in mint condition cost around 20,600 USD. Currently, there are over 70 different Royal Oak Offshore variants. The Royal Oak Offshore Diver is a good choice for divers. This automatic watch has a 42-mm case and, as required on all diving watches, a unidirectional rotatable bezel so you can keep track of the dive time. However, the Offshore Diver features an internal bezel, which you turn counterclockwise via a second crown at 10 o'clock. There are also Diver variants with a chronograph function. The Grande Complication models are horological highlights in the Royal Oak Offshore collection. These watches have multiple complications, such as a perpetual calendar, chronograph, and minute repeater. The in-house automatic caliber 2885 has a 45-hour power reserve and is wound by the motion of your arm while on your wrist. The women's models often feature diamonds on the bezel, case, and dial. These watches are 37 mm in diameter and powered by either quartz or automatic movements. Most watches in the Royal Oak Offshore collection are chronographs, regardless of whether they're men's or women's watches. Thus, if you want an eye-catching watch with a timer, you'll certainly find something for you in this series. Most models have three subdials. Almost all of the men's watches have a diameter of 42 or 44 mm. The 30-minute counter is located at 9 o'clock, the 12-hour counter at 6 o'clock, and the small seconds at 12 o'clock. The date display is at 3 o'clock. The caliber 3126/3840 has powered these watches since 2007. Between 1993 and 2007, Audemars Piguet used the caliber 2226/2840. Both movements are automatic, meaning they wind themselves while being worn. The caliber 3126 has a 22-karat gold rotor and a 50-hour power reserve. It has a balance frequency of 21,600 alternations per hour (A/h), equal to 3 Hz. In total, the movement is comprised of 365 pieces, 59 of which are rubies. The caliber 3226/3840 is based on the in-house caliber 3120 from Audemars Piguet with a chronograph module from Debois Dépraz, a company that produces movement modules. Audemars Piguet uses the in-house caliber 3124/3841 in the Royal Oak Offshore Diver Chronograph models. The automatic movement has a 50-hour power reserve and a balance frequency of 3 Hz. Unlike the 3126/3840, which has three subdials, this caliber only has two. The small seconds is located at 3 o'clock and the 30-minute counter is at 9 o'clock. This movement doesn't have a date display or a 12-hour counter, giving the watch a cleaner appearance. The Royal Oak Offshore Diver Chronograph is available in many different, bright colors, such as green, yellow, and orange. With a timepiece like this on your wrist, you're sure to stand out. The Royal Oak Offshore Tourbillon Chronograph is a true example of haute horlogerie. As its name suggests, it features a chronograph and a tourbillon. The tourbillon was invented by the watchmaking genius Abraham-Louis Breguet in the 19th century in order to minimize gravity-related deviations in time. Tourbillon watches are some of the most precise timepieces in the world. The tourbillon is visible on the Royal Oak Offshore Tourbillon Chronograph thanks to the skeletonized dial. The in-house caliber 2933 powers the watch and has an incredible 237-hour power reserve, equal to nearly 10 days. You can set your Tourbillon Offshore aside, put on your Millenary instead, and the Offshore will still be working a week later. The caliber 2933 has the tourbillon at 9 o'clock. A large bridge spans the cage and the balance wheel. The dial is skeletonized at 6, 9, and 12 o'clock, allowing you to view the inner workings of the watch. The 30-minute counter is located at 3 o'clock. Since this timepiece is water resistant to 100 m (10 bar, 328 ft), you can even go swimming with your tourbillon watch.